Size of Male: 18 lbs., 15.5 in. Size of Female: 18 lbs., 15.5 in. 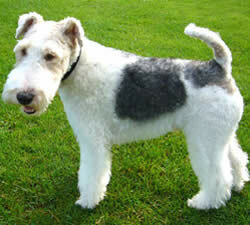 Friendly, bold and cheerful, the Wire Fox Terrier is one of the oldest of all terrier breeds. These dogs were bred as far back as the 17th century to go to ground after foxes and hunt other vermin that plagued farmers. The Wire Fox Terrier is a very active and intelligent dog and can do very well in agility and other dog sports. They love children and make wonderful family pets. Also known as the Wirehaired Fox Terrier, this dog breed is probably descended from the old rough-coated, black and tan working terrier of Wales, Derbyshire and Durham. The dog’s wire coat protected it in rough cover when it went after foxes and other small game. For over 100 years the Wire Fox Terrier and the Smooth-Coated Fox Terrier were combined together in the United States as one breed and shown as two varieties. Smooth-Coated Fox Terriers have different ancestors. There was interbreeding between the two kinds of dogs at one time. Early breeders crossed Wirehaired Fox Terriers with the Smooths to give the Wire some desired physical characteristics, but this practice ceased many years ago. The two breeds were separated in the United States in 1984. The Wire Fox Terrier is a bold and confident dog but he is also good-natured, usually getting along well with other dogs. They are very active at all times and they love to be around people. These are very intelligent dogs, although they can also be inclined to be independent and think for themselves. These dogs do have a strong desire to please their owners which makes dog training easier. Wirehaired Fox Terriers love children and they make good playmates. These are very playful, fun dogs. The Wire does have strong hunting instincts and they are apt to view small animals as prey. This can include other small pets such as birds or gerbils in your household, so do not leave any small pets unattended. They can learn to respect cats if they are well-socialized with them from a young age. These dogs will dig. Make sure that your fences are always secure as these dogs like to roam and explore given the opportunity. Living Environment – The Wire Fox Terrier can make a good apartment dog if you provide plenty of daily exercise for him. These dogs need both mental and physical exercise to keep them from becoming destructive in the home. Grooming – Grooming for the Wire will depend on whether you want your dog kept in a pet trim or in a show trim. A pet trim will require a trip to the groomer 3-4 times per year. The groomer will likely use clippers on the coat to keep it short. The downside is that, when clipped, the colors of the coat won’t be as vivid. The other way of grooming a Wirehaired Fox Terrier is in a show trim. This requires regular hand stripping. You can learn to do this yourself or take your dog to someone who knows how to do it. Basically, dead hairs in the coat are plucked out by hand as they stick out and become straggly. This is necessary since this dog breed sheds very little. Plucking the dead hairs out this way keeps the coat trim and the colors vibrant. However, it is very labor-intensive and needs to be done continually. Talk to your dog’s breeder about the best way to take care of your dog’s coat. Diet & Exercise – The Wire Fox Terrier has normal dietary needs. You should not allow this breed to overeat. They do require plenty of daily exercise since they are a very active dog. If they don’t get enough exercise they can become destructive in the home, chewing on furniture and developing other dog behavior problems. Wirehaired Fox Terriers do enjoy having a good run but you should be very careful about allowing this dog to run off-leash. They will chase and kill small animals. Health – The Wire can be prone to epilepsy, lens luxation, distichiasis (an eyelash problem), cataracts, Legg Perthes Calves disease, shoulder dislocation, and post nasal drip. If you are thinking of getting this breed of dog, you should talk to a breeder about possible dog health problems in the breed. The Wire Fox Terrier is a very intelligent breed and they have a strong desire to please. They can be independent at times and may not always listen to you, but dog training is usually not that difficult, especially for a terrier breed. Use positive dog training methods (praise, reward) with this dog breed and you should be able to train your dog.